I have a longer blog about my thoughts on Belhaven and a couple of their stouts coming up so I'll say no more on them. I can't work out his choice of available Scottish beers though as to me it seems very random, perhaps that is the meaning ? 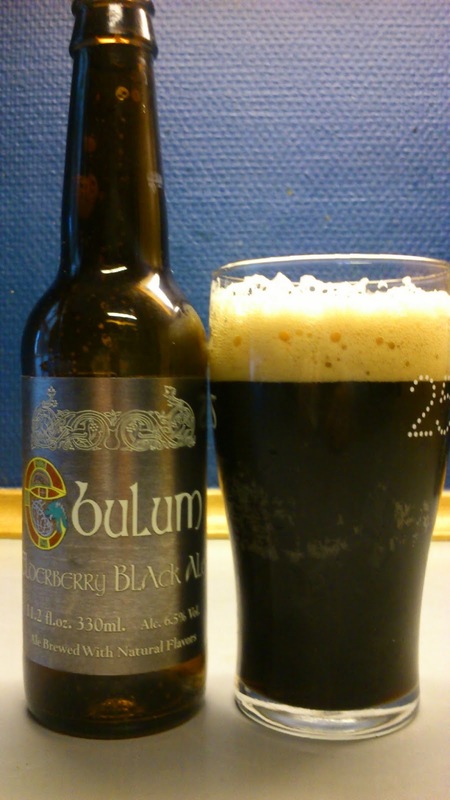 On to Ebulum which is an elderberry Black Ale. Wafts of black berries and what smells to me like pumpernickel bread coming off this when pouring. Ebulum pours black with a small creamy tan head. Ripe black and blue berries, black cherries, prunes and roasted smokey malt on the sweet intake while mild floral hops appear in the finish. Coffee and dark chocolate linger in the long aftertaste. A bit of a thin mouthfeel but not at all watery and no alcohol shining through. Time for a Scottish expression..This is a pure belter of a beer ! Meaning for non-scots it is excellent. There is that much going on I'd love a second bottle. My only gripe with this brew is in the murky waters of if it is an ale or a stout ? I'd have no problem if this was called an elderberry stout instead of black ale. Either way, I really enjoyed it. This scored 8.5/10 on my 'the tabloid guy might be right this time' Beerometer. Where to buy CPH : Fish & Beer had it in their Historic Ales of Scotland gift packs. no hops... just elderberries and malt extract... plus water and yeast. the first mouthful I had went "right oop me nose"!! which we knew it wasn't from previous tastings.